I'm tired. I got my wisdom teeth yanked, I work 6 days a week, and I helped my significant other with moving all the things last week. I have approximately zero social energies. Things have just been one thing after the other here, and this lil cake is right in the thick of it. I have the honor of creating my eldest sister's wedding cake. Yes, this is an arduous task, but so far I have had such a fun time researching for this. What you see pictured is what will be the top tier of a 3-story semi-naked caked. This rich little beaut packs a punch. 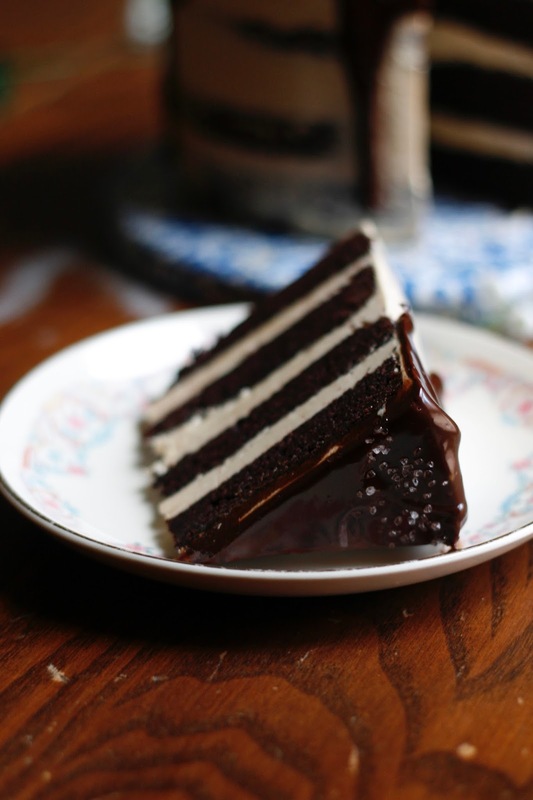 The cake's ever-lasting moisture is accomplished by a glorious mixture of fancy Irish butter, sour cream, and an imperial chocolate stout from the brewery Southern Tier (as one of the brides-to-be loves a good, dark beer). 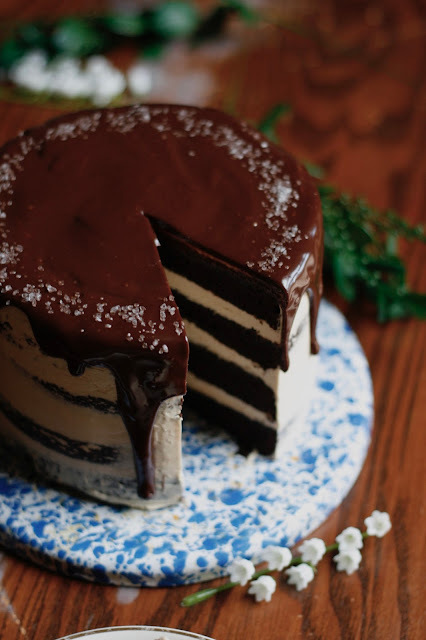 The cake is the perfect texture, in my humble opinion. It's dense, but not so dense that it would be mistaken for a brownie (especially not at room temperature). The frosting is more for my sister's taste. 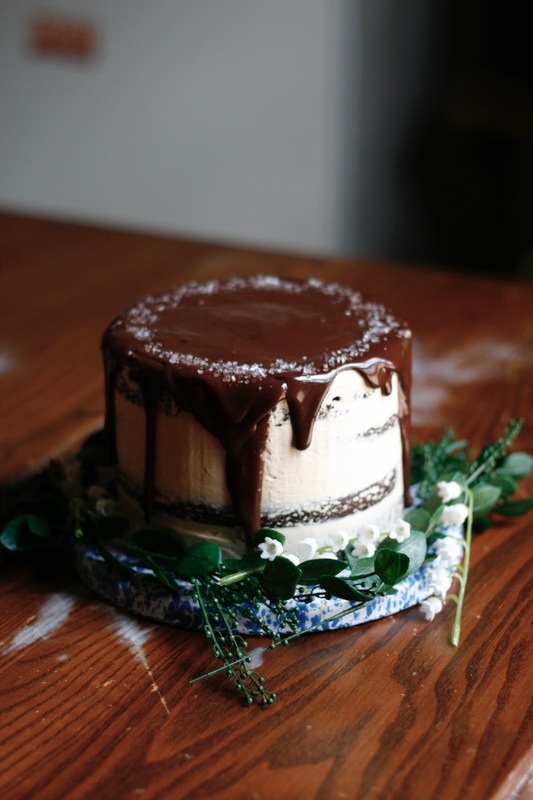 Neither she or her fiancé are big frosting fans, hence the naked-cake-look. So I decided to steal my parent's stand mixer and tackle the elusive but incredibly tasty swiss meringue buttercream. SMB on its own is superb, but I've been making my sister small batches of caramel as gifts ever since I learned how to melt sugar. Naturally, I whipped up a large batch of salted caramel and poured a hefty amount into the frosting for flavor. 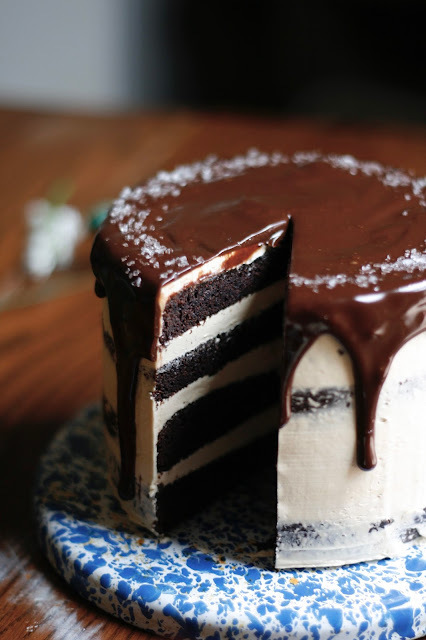 Then, dear gawd, the research I did on how to tier/what dowels to purchase/how the heck you even frost and divide layers evenly...let's just say my boyfriend can easily attest to the hours I spent poring over youtube videos and articles on my laptop. Unfortunately, the final stacking and tackling of the cake is yet to come. And possibly even some spun sugar...? Who knows! Either way, the best way to finish this little taste cake off was with a generous drizzle of ganache and a smattering of coarse sea salt to compliment the sweetness. And whooda thunk that Martha Stewart would have all of my bases covered in one simple google search for flavors? Crazy, man. I dare say, I think it's going to come out just fine. And if you don't take my word for it, try this baby cake out for yourself, and then just see if you can keep your fork out of it. First, prepare the caramel sauce, so it has time to set and cool at room temp. Heat cream in a small saucepan over low (alternatively, microwave it for about 30 seconds, until warm). In a medium saucepan, stir together sugar, corn syrup, and 1/3 cup water; cook over medium-high, without stirring, until mixture is dark amber in color, about 15 minutes. Remove from heat; carefully pour in cream (mixture may splatter) and stir until smooth. Reduce heat to medium and cook until a candy thermometer reads 238 degrees, about 2 minutes. Pour mixture into a medium heatproof bowl; stir in salt and vanilla. Let cool about 15 minutes, then stir in butter, 1 tablespoon at a time. Let cool completely. To prepare the cake, in a large saucepan over medium, bring stout and butter to a simmer. Remove from heat; whisk in cocoa powder until smooth. Let cool completely. Preheat oven to 350 degrees. Butter two 6-inch round cake pans. Line bottoms of pans with parchment; butter parchment. Dust pans with cocoa powder; tap out any excess. Whisk together flour, sugar, baking soda, and salt in a large bowl. In the bowl of an electric mixer fitted with the paddle attachment, beat eggs and sour cream and vanilla until combined. Add stout mixture and beat on low speed until combined; then add flour mixture and beat until combined. Fill each pan halfway with batter (you will have some extra batter, sorry not sorry). Bake until top springs back when lightly touched and a toothpick inserted into centers comes out with just a few crumbs attached, 35 to 45 minutes. Transfer pans to a wire rack and let cool 10 minutes, then turn cakes out of pans, invert right-side up, and let cool completely. Wrap cakes in plastic wrap and let chill in fridge overnight. (this isn't mandatory, but it does make the cakes much easier to handle). For the frosting, wipe the bowl of an electric mixer with paper towel and lemon juice or white vinegar, to remove any trace of grease (it's a good idea to wipe down anything you'll be using for mixing the meringue). Combine egg whites and sugar in mixer bowl, and simmer over a pot of water (not boiling), whisking constantly but gently, until temperature reaches 140°F (or if you don't have a candy thermometer, until the sugar has completely dissolved and the egg whites are hot). Switch over to paddle attachment and, with mixer on low speed, add butter cubes, one at a time, until incorporated, and mix until it has reached a silky smooth texture (if curdles, keep mixing and it will come back to smooth). *If mixture is too runny, refrigerate for about 15 minutes and continue mixing with paddle attachment until it comes together. Add vanilla and salt, continuing to beat on low speed until well combined. Once everything is smooth and fluffy, add in 1 cup of caramel sauce and mix until combined. 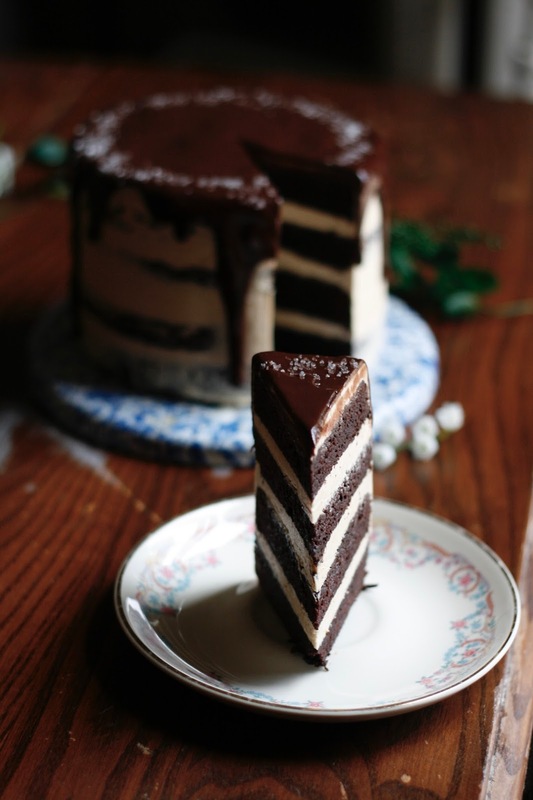 To assemble, slice the cake layers in half with a serrated knife and level the tops, if necessary. 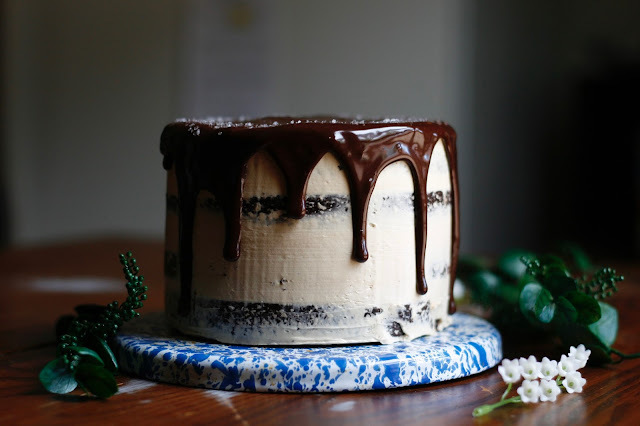 Stack and frost your cake as desired. To make the ganache, place chocolate in a medium bowl. In a small saucepan over medium, bring cream just to a boil, then pour over chocolate and let stand 1 minute. Stir until smooth and shiny, then stir in butter. Let stand 10 minutes before using. Drizzle over the top of the cake and sprinkle with coarse sea salt, if desired. Best served at room temperature.